Hakone is one of the most accessible destinations to try a ryokan. These hot springs with a view of Mount Fuji offer a wide choice of traditional hotels for every budget. It’s the perfect place to both try a ryokan and an onsen for the first time. I’ll share with you my selection of the best ryokan located in Hakone in this article. I’ll also give you some tips for choosing your Japanese traditional inn according to your budget and needs. 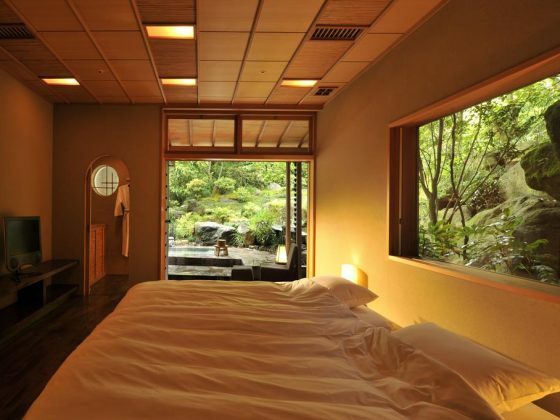 Why sleep in a ryokan in Hakone? Ryokan are traditional hotels in Japan. Besides sleeping in authentic Japanese rooms, you can enjoy high-quality services. Ryokan are the accommodation type that the Japanese prefer when they stay in an onsen. Onsen are Japanese hot springs, and Hakone is one of the most popular hot springs in Japan. It’s mostly because this town is easy to access from Tokyo. The hills surrounding Lake Ashi leave enough space to see the snowy summit of Mount Fuji. By opting for a night in a ryokan, you will mark your trip with an unforgettable memory. You will be far from your daily life or the neon lights of the Japanese capital city. 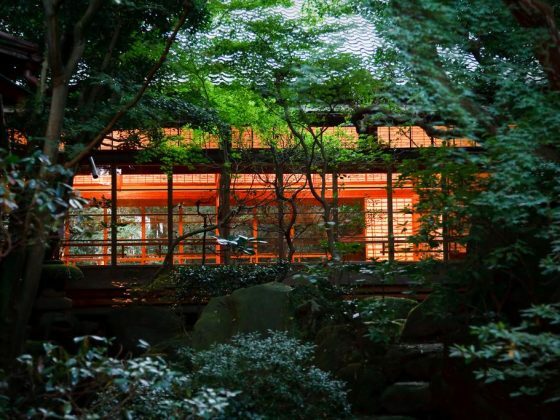 What are the best ryokan in Hakone? You’ll find my selection of most appreciated ryokan in Hakone hereafter. They each have their own amenities. So I hope you can find in that short list the traditional hotel that will suit your needs in this sacred place. Please note that all listed inns offer onsen. As I already said, Hakone is one of the most famous hot springs in Japan, it would be a shame not to try its hot waters. You will find the location of all the ryokan listed in this article on the map below. I hope this will help you choose your Japanese traditional hotel in Hakone. Although all ryokan offer quality services that respect Japanese traditions, some are more authentic than others. So I went looking for the most traditional hostels in Hakone. I found two addresses that will take you back in time. Spending a night at this hostel is like jumping back in time. The rooms are traditional, spacious and not so expensive for an inn of this type. If I had to choose only one ryokan in Hakone, that would be this one! The most traditional hotel in town? 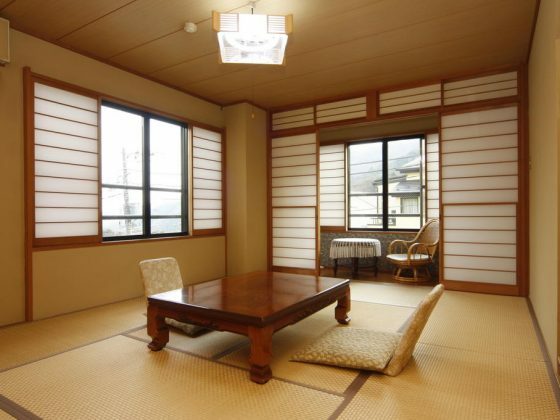 This inn offers traditional rooms with tatami and private onsen. It is surrounded by wildlife, which is perfect if you like to go hiking. The property is not cut off from the world, there is a bus stop nearby. Hakone being a popular destination for tourists, there are many luxury hotels in this village. If you are not restricted by your budget, I have selected two ryokan offering the best services for you. If you have a limited budget, I invite you to go lower in this article. Because I have also picked two more affordable inns. This five-star hotel offers a relaxing environment in the middle of green mountains. Indeed, this ryokan a little away from the city. But this location is making it the perfect place to rest after spending several days in the noisy Tokyo. This ryokan is at the top of a hill. This inn focuses on the authenticity and traditions. 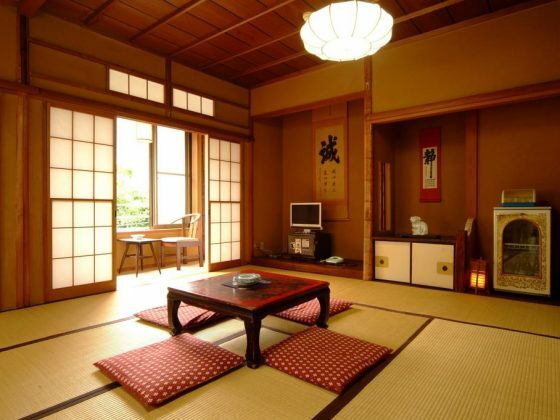 Its rooms are covered with tatami mats. You can also find indoor hot spring baths. 100% of customers are satisfied! Where is the cheapest ryokan? Since Hakone is a very popular place for people from Tokyo and foreign tourists, it is rare to find very good deals there. For this reason, some unsavory hotels pretend to be ryokan, while they are not traditional at all. Do not fall into the trap by trying to pay the cheapest price. If you want to try a traditional hotel at a low price, Hakone is not the best destination. In this case, I advise you to target other Japanese hot springs, even if they are more difficult to access. Despite that, here are two traditional hotels in Hakone offering more affordable rates than the ones I have already shown you. I preferred to select ryokan that offer authentic experiences rather than looking at the cheapest hotel in the town. By choosing one of the inns below you will thus be guaranteed to have the best value for money for this type of hotel service. 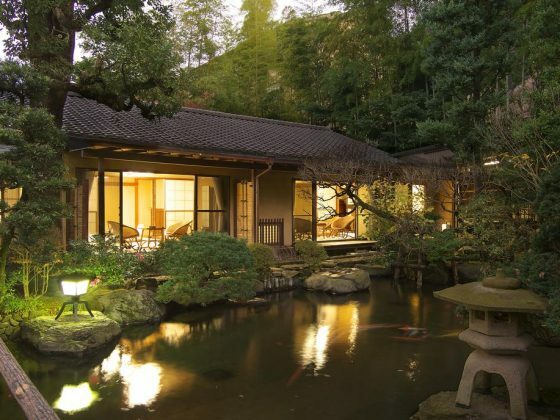 This two-star ryokan offers rooms for two from 140 US dollars per night. For this price, you will sleep in a Japanese style room. You also have the option to book a private onsen for an additional cost. In addition to offering luxurious suites, Umimoto offers several rooms at more reasonable prices. Whatever your budget is, the style of the rooms is always traditional. Moreover, this inn has indoor and outdoor hot-spring baths. Lake Ashi and the shrine on its shoreline offer breathtaking views of the summit of Mount Fuji. Unfortunately, most ryokan in Hakone are behind a hill that hides the highest volcano in Japan. 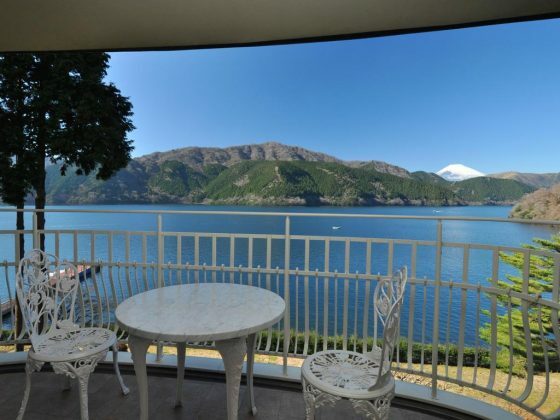 To be able to admire the sacred mountain from your room, you will have to choose a hotel located near the lake. So I have selected the two best hotels located at the edge of this water point. 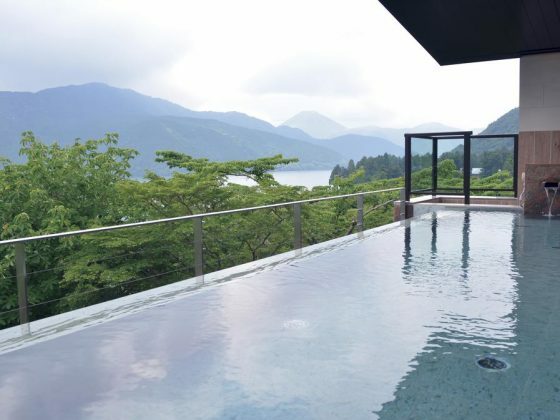 Located on Lake Ashi, this luxurious hotel offers Mount Fuji views from a naturally heated infinity pool. The floor of the rooms is covered with tatami. Moreover, you can enjoy traditional seasonal meals there. This hotel is less traditional than all others on this page. But it has the advantage of being located on the shores of Lake Ashi. You can have a view of Mount Fuji and take baths in waters heated by volcanoes. Rikyuan offers private outdoor baths. This is the ultimate experience if you want to relax in a Japanese way. As for Gora Kadan, offers indoor onsen with large windows. So you will feel like in the middle of nature even if you are under a roof. Fukuzumiro is plainer but remains traditional. It has a bath that can be privatized in a room fully made of wood. Tsukinoya is the cheapest ryokan on this list. It offers a stone bath that can be privatized for an additional cost. If you are not traveling in Japan for several weeks and you have never tried a ryokan before, Hakone is the perfect place for you. This spa is relatively easy to reach from Tokyo. The view of Mount Fuji adds even more charm to this sacred place. Unfortunately, the success of this village has increased the prices of traditional hotels in the region. You will have to pay more than usual to be able to try a ryokan. That’s why I would recommend looking at other Japanese onsen if your budget is limited and you have time to go to a more isolated village. Feel free to ask me all your questions about traditional hotels and onsen in Hakone in the comments below. Also, if you would recommend other ryokan in the area, feel free to share them here. In any case, I will answer you as soon as I have some spare time.